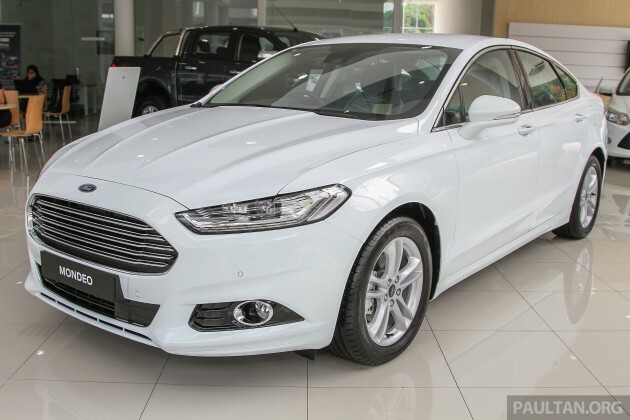 It officially launched last week in Malaysia; now we give you a closer check-out at the fifth-gen 2015 Ford Mondeo, almost as if you’re in the showroom yourself. The sharp-suited sedan’s come all the way from Valencia, Spain to challenge the likes of the Toyota Camry, Honda Accord, Nissan Teana, Mazda 6 and Volkswagen Passat. Where kit is concerned, our car largely apes Australia’s mid-level Trend variant, but adds a few bits from the top Titanium trim. We get adaptive cruise control, keyless entry and start, dual-zone auto air-con with rear vents, 10-way powered front seats and auto lights and wipers, as well as shift paddles, front and rear parking sensors and an electronic parking brake. MyKey allows the programming of features such as setting the maximum speed limit and the maximum audio volume, while the eight-inch SYNC 2 touch-screen incorporates a reverse camera display, Bluetooth, USB, AUX and Voice Command. No navigation, but there’s a nine-speaker Sony sound system. On the outside, you’ll make out adaptive LED headlamps with DRLs, twin tailpipes and 17-inch twin five-spoke alloys covered in 235/50 rubber. Under the bonnet is its predecessor‘s 2.0 litre EcoBoost engine, so you get the same 240 PS at 5,300 rpm and 345 Nm of torque between 2,300 and 4,900 rpm – but this time, the motor works with a conventional six-speed auto instead of the six-speed PowerShift twin-clutcher. The safety arsenal comprises ABS, EBD, ESC, traction control, hill launch assist, Isofix and seven airbags. There’s also Lane Keeping Alert + Aid, but no BLIS, lane departure warning, Active City Stop, enhanced Active Park Assist nor Pre-Collision Assist with Pedestrian Detection. The price to pay for all this is RM203,771, OTR with insurance and GST. Included is a three-year/100,000 km warranty and three years’/60,000 km free service. Tectonic Silver, Frozen White, Panther Black and Ruby Red body colours are available. Read our comprehensive launch report, first drive impressions and explore the 2015 Ford Mondeo in greater detail on CarBase.my. RV drops like its hott….. Except this car can fly. Or with this price? You still going to stuck in traffic jam. Make no difference. Stupid, you really believe that the rubber mats are meant for the car? It’s clearly put by the showroom to protect the car. Dumb! So crazy of the new Mondeo? Why not wait for 9 months get a second hand. Don’t waste your hard-earned money. Rubber mats in 200K car… for showroom only la. Why not also say that Ford gives cheap plastic car seat protectors.. Reminds me of a quote…. nice genuine rubber floor mats! 200k car must give genuine getah lar comeon what u expect less? Just confirmed with ford showroom, this is the mat for ford buyers! The security guard at the showroom gave you that answer Issit? When I test drove the car, the showroom car hard really nice carpet mats matching the interior wrapped with premium plastic for the car lo. the look of it gimme the feel like a white dump elephant trying to run fast..
Yeah. Cheaper to replace the tyres, better comfort, perhaps even better handling (given how uneven the road surfaces in Malaysia are). Better performance, better fuel consumption. There are MANY benefits to smaller rims, and only one disadvantage. I’ll take the smaller rims, thanks. Go and check out this car and you’ll find this is a great car for all it has to offer.. nothing close to Mazda6, Teana or Accord… not to mention Camry.. Personally I like this car… but if I wanna to buy.. i would wait for ford to give their cash rebate as usual with their other models.. I agree. I test drove it and its a gem of a car. Unfortunate that its being ruined by poor dealership management, spare parts availability and Service Center Services.. and this just adds up to super low resale value. Such a pity. Its a great car. Judging from the majority of the public response, the high price tag is a big put off / major setback for this model. It’ll only carved a niche market (Ford die-hards) in the Malaysian scene when actually, this car is a normal bread & butter D segment model in the other parts of the world. Why Sime Darby Auto/Ford Malaysia omitted the 1.6 Ecoboost engine (as of now) is a big question mark. It does’nt really have the sublime / bold design of the Citroen DS6 or VW CC (which command near premium price tags) , let alone the brand prestige of the German Big 3, Jaguar & Lexus. What exactly Sime Darby Auto/Ford Malaysia is targeting with this model? Frankly speaking, it looks a bit bleak for the new Mondeo in our local market. They need to offer a lower-spec engine version (1.6 Ecoboost, thus the lower price) in order to gain any significant foothold in the D segment. Nonetheless, this is a well-built & fine handling car, it’s just that the strategy of only offering the top-spec version could backfire Ford. They should focus on building a great service network with good service and monitor parts availability. This will slowly grow a customer base to increase resale value. Seems that Sime Darby is not invested in building the ford brand here. Zero commitment. Bread and butter, but not with these specs. Maybe Ford should be offering a lower spec model that is financially more competitive, but since the car isn’t assembled in Malaysia there’s no way they can get the price down enough. So they may have figured that if they bump up the specs maybe they can sell a few. I mean, maybe they can get it down to 170k? But there’s the Camry hybrid, which is very well speced. The Passat is. etc. It might lose that battle too. Just wondering how many rich creatures out there willing to pay 200K plus for this not so luxury brand? Ford just trying too hard.. who are they targeting customers? Perhaps bunch of corrupted goverment servants who have no idea how to make full use of their side income. i will wait for the secandhand then only i buy. maybe 70k at 3 years time? Guys if you cant afford please refrain from commenting. Please go back to your Myvi, Protons or Vios. The rest of us do not care of RV. Why bother to drive when all you can think of is RV?? U sure ah? 2 year car drop 50% of purchase price. Thts close to vw second hand value. There’s acceptable loss in depreciation but ford is just too high. Am not even sure if there is any demand for used mondeos in Malaysia. That is the same kind of price drop you’d see with a Camry or Accord. It’s simply the D segment, expect massive RV drops. Don’t want that, stick to B segment. Or buy a second hand D segment car. If you can’t afford the depreciation, that means you can’t afford the car. Period. Aim lower instead of inflating your own ego with something that you can’t truly afford. Then can you afford one? Or a day Mondeo dreamer? Judging from the majority of the public response, the high price tag is a big put off / major setback for this model. It’ll only carved a niche market (Ford die-hards) in the Malaysian scene when actually, this car is a normal bread & butter D segment model in the other parts of the world. Why Sime Darby Auto/Ford Malaysia omitted the 1.6 Ecoboost engine (as of now) is a big question mark. It does’nt really have the sublime / bold design of the Citroen DS6 or VW CC (which command near premium cars price tags) , let alone the brand prestige of the German Big 3, Jaguar & Lexus. What exactly Sime Darby Auto/Ford Malaysia is targeting with this model? Frankly speaking, it looks a bit bleak for the new Mondeo in our local market. They need to offer a lower-spec engine version (1.6 Ecoboost, thus the lower price) in order to gain any significant foothold in the D segment. Nonetheless, this is a well-built & fine handling car, it’s just that the strategy of only offering the top-spec version could backfire Ford. Does this car come with a free printer? Front copy Aston Martin, rear copy Kia Optima. the new ford mustang is about 10k CHEAPER in Taiwan! this is seriously overpriced!! i bet the mustang is gonna be about at lest 250k when it reach here !